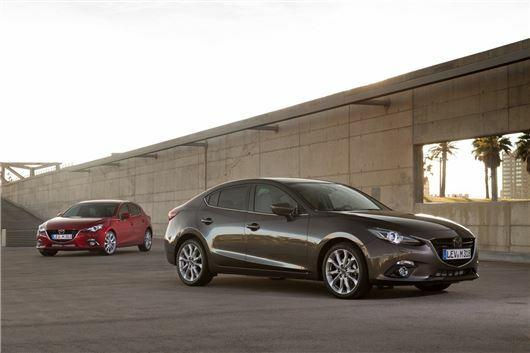 The new Mazda3 is set to offer company car drivers considerable savings when it goes on sale in January 2014. The new model will feature Mazda’s latest Skyactiv engines and be available in hatchback or saloon body styles. Aimed at the lower medium company car sector, the Mazda3 has five trim levels and a choice of three Skyactiv-G petrol engines and one Skyactiv-D diesel. The Skyactiv-G 1.5-litre petrol has 100PS and can return to 55.4mpg on the combined cycle. Emissions are low, with just 119g/km of CO2, which equates to an extremely low ‘benefit in kind’ (BIK) tax rate of 15 per cent. The 2.0-litre 120PS engine will return similar numbers, with a claimed 55.4mpg and 119g/km of CO2. The established 165PS 2.0-litre engine completes the petrol line-up, with 48.7mpg on the combined cycle and 135g/km of CO2, which results in a BIK rate of 19 per cent. The range also sees the introduction of the 2.2-litre Skyactiv-D diesel powerplant, which Mazda believes will make up the mainstay of sales. The diesel unit meets Euro six emissions standards and emits 104 g/km of CO2. Offering a low BIK rate of just 12 per cent, the 2.2-litre diesel will return an impressive 72.4mpg. On the road prices start at £16,695 for the Mazda3 hatchback 1.5-litre Skyactiv-G SE hatchback and extend to £23,345 for the 2.2-litre Skyactiv-D Sport Nav auto hatchback. The prices for the saloon, with the 2.2-litre diesel, start at £19,245 for the SE derivative and extend to £22,145 for the Sport Nav variant. Company car driver benefit-in-kind tax bills start at just £48 a month in 2014 for a basic rate taxpayer (£96 a month at the higher rate).